The endocrine ( “endo,” meaning within, and “crinis,” meaning secrete.) system is a collection of glands which each produce and secrete different types of hormones that affect changes in the body such as growth and development, the regulation of metabolism, tissue function, sexual function, sleep, mood etc. These glands are groups of cells that select and remove substances from the blood, process and use them to secrete a finished chemical product (hormone), into the blood or tissue for use somewhere in the body. Almost every cell in the body is affected by this system. The endocrine system is similar to the nervous system in that it sends signals throughout the body; however the responses are less immediate, sometimes taking hours or weeks to cause an effect. Endocrine glands have intracellular vacuoles, or granules to help them to store hormones, unlike exocrine glands, salivary or sweat glands for example, they do not have ducts. For example Cortisol, Progesterone and Testosterone. Definition: lipid soluble hormones that pass through the cell membrane of the target cell and influence its activity by activating specific genes. These are slow acting. The common theme with steroid hormones is that they have a steroid nucleus which is derived from cholesterol. Attached to this ‘cholesterol’ core (which in essence acts as a carrier) are other chemicals. It is the configuration of these molecules that makes a particular steroid unique. Cholesterol is particularly important in the synthesis of steroid hormones in the endocrine glands. Being lipid based makes a steroid hormone very suitable to being a hormone. All cells have a membrane made from phospholipids, so that the lipid soluble hormone has no problems passing through the cell membrane and then making its way to the nucleus, where it will initiate a response. Travelling in the water based blood plasma presents complications but steroid hormones attach themselves loosely to a plasma protein carrier molecule. When the steroid hormone nears the target cell, it disassociates itself from the plasma protein and diffuses out of the capillary into the extracellular fluid and on to the cell. Once inside the cell it makes its way to the nucleus where it binds to a mobile receptor, forming a mobile hormone-receptor complex. The mobile hormone receptor complex then binds to a specific site on a DNA molecule which triggers transcription of the genetic information encoded there. Steroid hormones regulate cells by regulating the production of certain critical proteins, which in turn control certain intracellular reactions and membrane permeability. 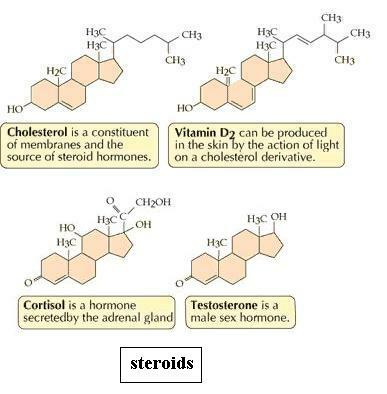 Definition: hormones synthesised primarily from amino acids (rather than cholesterol) eg. glucagon, insulin, oxytocin. Their mechanism for activating the target cell is quite different. Non steroid hormones are diverse -they may be long and complex protein chains such as insulin or short and simple peptide hormones such as oxytocin. The Non -steroid hormone acts as the first messenger, binding to a target cell receptor on the cell membrane. This initiates a series of chemical reactions which ultimately produces a 2nd messenger inside the cell with the overall effect of amplifying the hormone’s initial response. This in turn activates specific hormones that then influence specific cellular reaction which produce the target cells response to the hormone. 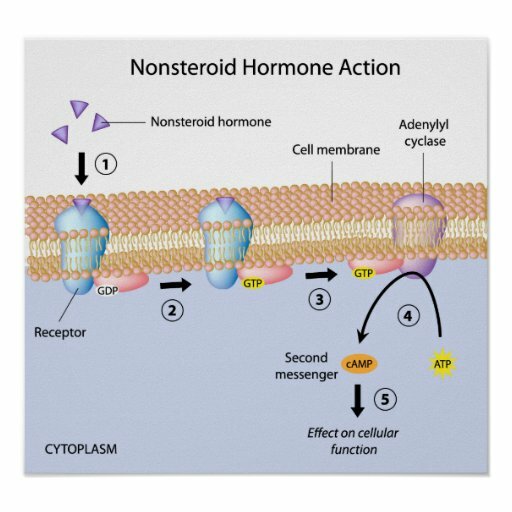 The non-steroid hormone acts as a first messenger and initially attaches itself to a fixed receptor molecule on the cell membrane which will only accept that specific hormone. This initiates the binding of a membrane protein inside the cell called a G Protein, to a nucleotide called guanosine triphosphate or GTP. The GTP activates another membrane protein which in this case is called adenyl cyclase. This important enzyme detaches itself from the inside of the membrane and seeks out an ATP molecule. Once in contact with some ATP it proceeds in stripping off two phosphate molecules, releasing energy and converting it to cyclic adenosine monophosphate or cAMP. The cAMP molecule, officially the 2nd messenger is able to activate protein kinases, which are required to convert inactive proenzymes into their active form – leading to the target cell’s response to the original hormone. Definition: A group of naturally occurring lipid based substances that act in a similar way to hormones and affect many body functions such as vasodilation, uterine contraction and the inflammatory response. Prostaglandins are produced by the highly unsaturated essential fatty acids. The result is a short-lived hormone-like chemical that regulates all cells on a moment by moment basis. They are often referred to as tissue hormones‘ because they are produced in tissues and travel a short distance to affect change in neighbouring cells. They have a potent regulatory effect. Series 1 and 2 prostaglandins are formed from essential fatty acid (EFA) Linoleic Acid, also known as omega 6’s. The conversion of linoleic acid to prostaglandin E1 (PGE1) is responsible for many beneficial effects upon the system. PGE 2 is detrimental but will be overridden if adequate PGE1 is produced. Aspirin is prescribed to reduce inflammation because it inhibits the production of PGE2. It is better to do this through producing enough PGE3. In physiological terms, prostaglandins have several diverse effects; being among the most powerful natural biological compounds. They are fundamental to endocrine regulation and function and each class will operate to specific biological effects on a cellular, vascular, metabolic and gastro intestinal level. Furthermore prostaglandins are paramount in the regulation of the reproductive system. These essential therapeutic functions of the prostaglandin family, at all levels in the human body, have been employed in the treatment of several conditions ranging from hypertension to asthma. Hormones are made in the endocrine glands. They are either made from the lipid cholesterol and known as steroid hormones. Or they are made from amino acids (proteins) and are called non-steroid hormones. Steroid hormones being lipid based are easily transported through the cell membrane, where they activate the synthesis of new proteins in the nucleus. 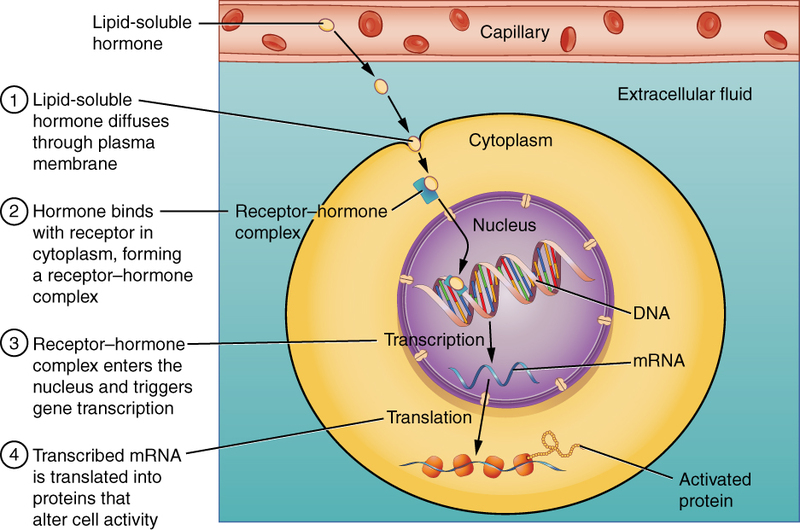 Their action is slow reacting and proportionate to the amount of hormone accepted into the cell. Non- steroid hormones tend to attach to the cell membrane which then activate a series of chemical reactions inside the cell that amplify the hormone’s message, producing faster responses and proportionately more reaction. Finally the all important prostaglandins that are produced from the two EFA families Omega 3 and 6, which are responsible for the moment to moment regulation of every cell in the body. The hypothalamus and the pituitary gland are “master endocrine glands.” Their actions mainly regulate the secretion of other hormones by other glands. The hypothalamus is responsive to many signals in the internal and external environment such as body temperature, feelings of thirst and hunger, stress and the circadian rhythm of our bodies. The hypothalamus acts directly on the pituitary gland, which in turns stimulates other organs and glands to secrete their own hormones to bring about the necessary changes required. The hypothalamus is associated with survival, arousal, enjoyment, the mind and body connection, the adrenal and nervous system connection. Develops from the roof of the diencephalon. In some lower vertebrates the gland has a well-developed eyelike structure; in others, though not organized as an eye, it functions as a light receptor. The thyroid gland works together with the hypothalamus, and the pituitary gland to maintain the balance of thyroid hormones in the body. As thyroid hormones control metabolism within the body we can see that together they work as a thermostat in a room, turning up, down and off and on the amount of metabolic and therefore temperature controlling thyroid hormone. The purpose of your thyroid gland is to make, store, and release thyroid hormones into your blood. These hormones, which are also referred to as T3 (liothyronine) and T4 (levothyroxine), (T3 gets three atoms of iodine, while T4 gets four atoms of iodine). 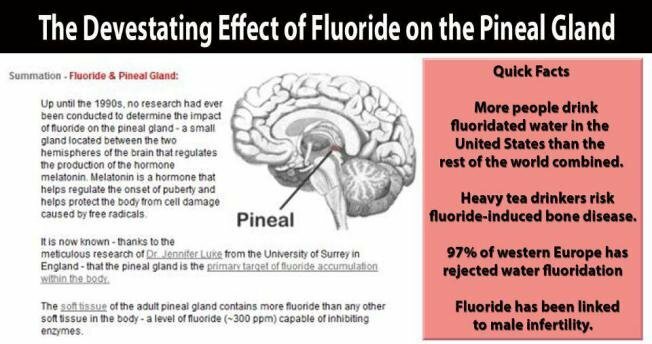 affect almost every cell in your body. The hormones are also involved in stimulating heart muscle contraction and nerve function, increasing the utilization of cholesterol and nutrients, ensuring normal growth and brain development. The thyroid gland is located at the base of the larynx and above the trachea. It forms lobes around the larynx and has an upward wormlike stem on the anterior surface. The thyroid is responsible for maintaining the metabolic rate of all cells, which also maintains body temperature. Metabolism is the breakdown, use, storage and exretion of of waste of the foods that we take in. Metabolism takes the form of either catabolism (breaking down) , or anabolism (building up). The thyroid gland also secretes calcitonin which stimulates calcium to be stored in the bone matrix and as such regulates blood calcium levels. Calcitonin increases the calcium storage in the bones. It therefore reduces blood calcium levels. Embedded in the thyroid gland are the parathyroid glands which secrete parathyroid hormone which has an antagonistic effect on calcitonin. So this endocrine organ maintains blood calcium homeostasis and as such is entirely self regulating. Parathyroid hormone increases calcium removal from storage in the bone and increases absorption of calcium by the intestines and so raises blood calcium levels. Aldosterone stimulates the kidneys to conserve sodium, which in turn triggers the release of ADH and the resulting conservation of water by the kidney. Cortisol influences the metabolism of food molecules in large amounts. This has and anti inflammatory effect. Epinephrine (adrenaline) Is secreted after the brain receives a perceived threat and initiates a fight or flight response through nerve impulses to the adrenal gland. The main effect of adrenaline on the body is to provide energy so that the major muscles in the body can respond to the threat. Norepinephrine is also involved with the fight or flight response and increases heart rate. 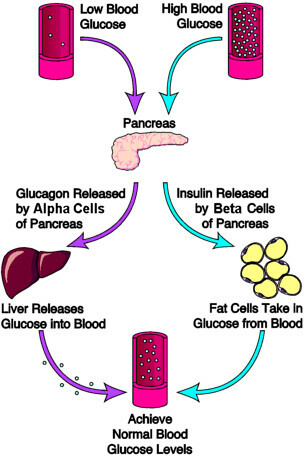 Somatostatin regulates the secretion of other pancreatic hormones. Pancreatic polypeptides useful for absorption in the digestive tract. Progesterone is pregnancy promoting and for maintaining the lining of the uterus.